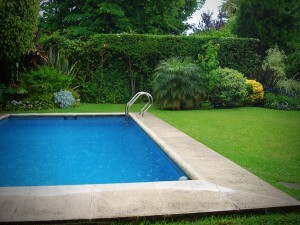 Thinking of buying a home with a pool and wondering how much maintenance will be needed? Pool care for beginners will help you to decide. Water is pumped around the pool and recirculated through the filtration and chemical treatment systems and with some extra effort on your part it can be kept free of leaves, bacteria, algae and mould. Skim the pool regularly with a net to remove dead leaves, insects and other debris from the surface of the water. Once you understand how a pool system works chemically, pool care becomes quite simple. The first thing you need to understand is that the water in a pool is constantly changing, and everything affects it. Weather, sunlight or the lack thereof, rain, oil, dirt leaves and of course, people, affect the water. Therefore checking the chemical balance of the water is an important task. To be considered balanced, water should not be scaling or corrosive. Scaling is an alkaline condition where water is over saturated with minerals and tries to discard the excess in the form of scale, which can harden into an ugly white deposit on the sides of your pool. Corrosive water happens when the water is lacking in minerals and tries to gather as many as possible which causes an acid condition which can damage your pool over time. What is required is a monitoring of the pool water’s pH levels. The Langelier Saturation Index is used to calculate chemical saturation levels taking all the guess work out for the pool owner. Basically if the test result shows between pH 7.2 and pH 7.6 the pool water is well balanced. If it is below or above those figures then the pool water is chemically either under or over saturated and you need to adjust it using the appropriate products to bring it back to balance. In the well balanced pool the Total Alkalinity (TA) will be at 80 to 125 parts per million (ppm) and the Calcium Hardness (CA) will sit between 200 and 400 ppm. Testing the water at least twice a week with your test kit, and once a month by taking a sample of water to a pool shop to verify your results, is enough to keep on top of any potential problems. Correcting the levels is a simple matter of adding some acid or alkali to balance the pH – your pool shop can tell you how much you need to add. One element that can affect the balance of pool water is temperature. Hot weather tends to send the water condition to alkaline and scale forming, while cooler temperatures send the water towards mineral seeking acidic conditions. Knowing this can take much of the guesswork out of caring for a pool. So if you feel that spending time on the pool twice a week is something you are willing to do, then go ahead and buy that house with a sparkling swimming pool, your efforts will be well rewarded. Great tips. every pool owner get confused for first time when it buy a new pool. thanks for sharing these beginner tips to new pool owner to confidently clean up pool without hiring for any pool care services.